There’s nothing more luxurious than a well-appointed hotel suite, and the ones at sea are some of the most spectacular in the world! Many cruise ships now have a limited selection of lavish suites for those who can get in quickly enough – restricted numbers mean that these accommodations are often the first to sell out. And it’s easy to see why – exclusive perks, baby grand pianos, a dedicated service team, priority dining and chic furnishings are just some of the features you may get to look forward to as a guest of these suites. So which are the five best cruise ship suites at sea? Maybe you’ve saved up for a glamorous holiday, or simply prefer the finer things in life – these accommodations are the only way to see the world in absolute comfort and style. Take your cruising experience to the next level – literally – with one of the Penthouse Suites available on all Celebrity Cruises’ solstice-class ships. Here, you can relax in modern luxury and take advantage of your access to Luminae and Michael’s Lounge, the exclusive restaurant and lounge reserved only for Suite Class guests. 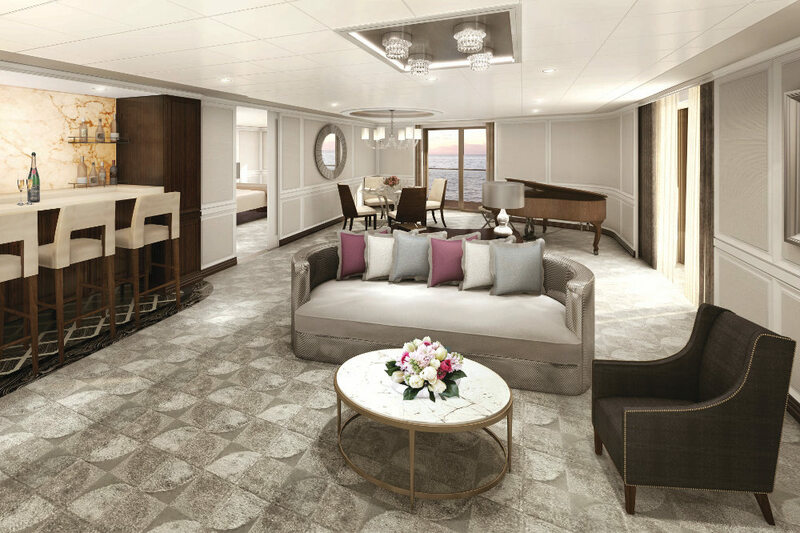 The suites’ most outstanding features then include a 24/7 butler service, priority embarkation and disembarkation, private veranda with a whirlpool and a baby grand piano in the suite’s separate living area. This cruise line is known as one of the most luxurious in the world, so it’s only fitting that the accommodations on board exceed even the highest of expectations. The Master Suite on the Seven Seas Voyager is the best that the ship has to offer, with one suite being located on Deck 11 while another is on Deck 7. These spacious accommodations hold up to six guests with two bedrooms, two and a half marble bathrooms, an expansive living room and a variety of perks. This includes free unlimited Wi-Fi, a free night in a luxury hotel before embarkation, a personal butler, discounts on premium wine and liquor, daily canapes and a complimentary mini-bar. Silversea Cruises offers a range of accommodation options, but the Owner’s Suite takes the cake – it is available in a one-bedroom or two-bedroom option and boasts a large teak veranda and range of premium facilities. Marbled bathrooms, an espresso machine, luxurious bedding, complimentary laundry and dry cleaning, free Wi-Fi, and dinner at the ship’s premier restaurant, Le Champagne, are just some of the features you get to enjoy as a guest of the Owner’s Suite. If you want a family holiday with that little bit of fairy-tale magic, then the Concierge Royal Suites on Disney Magic, Disney Wonder, Disney Dream and Disney Fantasy ships are just what you’re looking for. This is a one-of-a-kind Disney experience, featuring first-class facilities and an expansive veranda. You’ll also get to enjoy a private whirlpool, premium furnishings, and a premium location on Deck 12 – all with that Disney touch the kids will love. The Owner’s Suites on Oceania’s Marina and Riviera are simply divine. Furnished with pieces from the Ralph Lauren Home Collection, these opulent suites have a floor space in excess of 2,000 square feet. This includes an expansive living room, two walk-in wardrobes, and indoor and outdoor whirlpool spas, as well as exclusive access to the Executive Lounge: a space with a private balcony reserved for suite passengers.